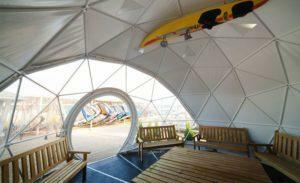 DIY Domes are perfect for sports. 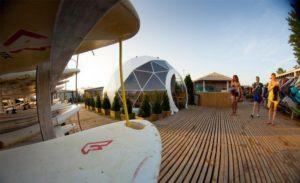 ORKA Windsurfing School uses Classic 30 dome as their residence at the beautiful and picturesque Hel peninsula. Geodesic structure of 6.3 m diameter is a place where passion for kitesurfing and windsurfing is explored by a wave of students who come here to interact with their instructors. The knowledge of the sea is passed on in a unique and comfortable setting of a dome that only took hours to complete. It provides safe and weatherproof shelter and an exceptional learning space where surfers can improve and fine-tune their water sport skills onshore. With its steel framework and durable PVC membrane, beach dome performs just great, even in a location where high velocity winds are something natural. Safety of the dome, which is also one of the most outstanding features of ORKA School, is one thing. Quality design and build is yet another. While having all the necessary certificates and meeting all the European norms for structures being assembled on windy destinations, the beach dome just couldn’t do without the watchful eye of F.Domes experts. This said, no dome leaves our premises before we know we have a high quality solution we can vouch for.